The First World War led to many profound changes in Canadian society, including expanding the security powers of the government and laying the foundations of the modern surveillance state. Through measures such as the War Measures Act and Section 98, certain wartime powers became a permanent means of judging people’s politics in peacetime. Surprisingly, this legacy of the First World War also spurred a politically diverse civil rights movement, whose mainstream leaders included J.S. Woodsworth, that helped form the basis for the progressive political and rights campaigns of future generations. Hugh Guthrie, who as Solicitor General was the major author of Section 98. Image from Wikipedia. In 1914 the Canadian government created the War Measures Act (WMA) and it was purposely designed as a “blanket act” meaning that it gave the government the power to craft whatever law it deemed necessary for the war. The reason the Canadian government did this was because it had looked at similar British legislation, the Defense of the Realm Act (DORA), and it thought it was not efficient because the British had to frequently amend it. Unlike DORA, Canada’s WMA had no end date and was broad enough to deal with anything that could come up. While the expectation was to only use it during the war, the fact that it had no end date meant that a peacetime application was entirely within the right of the government. In 1918 as the war was nearing its end, Robert Borden’s Union government became particularly concerned about labour militancy and activism. A number of socialist and anarchist groups had opposed the war and were quite militant. Many opposed not only the war, but capitalism broadly speaking. The government’s response was to use the WMA to pass an Order in Council called P.C. 2384 in September 1918 and it allowed the government to arrest anyone that belonged to an “unlawful organization.” This was any group that advocated that the government, economic system, or industry be changed by force or violence with force being left undefined in the legislation. It also made it an offence to distribute literature of this kind, and attend any meeting of such a group. The order was rescinded at war’s end but the government quickly realized that labour activism had not ended, but actually increased. Many returning veterans had no jobs, and the economy was in terrible shape. There were also unaddressed labour issues, including the fact that there continued to be no protections for collective bargaining, and resentment over the suppression of the right to strike during the war. All of these were factors in the unrest and contributors to the Winnipeg General Strike which shut down the city of Winnipeg for 6 weeks in May and June of 1919 as tens of thousands of workers went on strike. The government passed two measures fairly quickly in the summer of 1919, Section 98 of the Criminal Code and an amendment to Section 41 of the Immigration Act enabling British citizens to be deported. Both borrowed heavily from P.C. 2384 with Section 98 being a nearly identical copy. Referred to at the time by Senators as an “exceptional law,” Section 98 applied P.C. 2384 to everyone in peacetime. Section 41 targeted immigrants and permitted the government to deport those whose political views it opposed. Neither measure was used to end the strike but their existence in peacetime were significant because the crisis of labour militancy and unwanted political ideologies like anarchism or communism, were now no longer temporary wartime concerns. They were omnipresent and borderless. Canada drafted these laws alongside its U.S. and British allies who created similar laws in their countries. Section 98 would eventually be used against a Canadian political party when the country entered the depths of the Depression. Much of the Communist Party of Canada’s (CPC) leadership was charged with violating Section 98 in August 1931. The case posed an interesting dilemma. How do you prosecute individuals for violating what was in essence a wartime emergency law in a civilian peacetime courtroom? And more importantly, how do you defend yourself against such charges? The Crown essentially argued that communist ideology was itself a criminal act while the defense countered that Marxism was a means of studying history. The “Eight,” as they were known, were convicted and the majority sentenced to 5 year terms. In addition, the CPC was now unlawful and anyone who could be proved a member was automatically guilty of an offense. Worse, if you were an immigrant member you could be deported and that’s what happened to many people. Immigrant leading members of the CPC were rounded up in overnight raids and deported soon after the trial as were many others who were suspected of being members. Many were deported to regimes where they faced torture or execution. What we witness with the conviction of the party leaders and with the deportation of immigrant members is how state repression became tied to nation-building. Those political views that were unwanted, and hence illegal, were suppressed or removed from the country and in doing so the government and authorities were sending the message to immigrants and citizens about what kind of politics were acceptable for people in Canada. With the outlawing of the CPC, deportations were carried out against suspected immigrant members. In addition, police used Section 98 to shut down halls used by unions to organize strikes. Police also used Section 98 to randomly search premises and individuals to curb labour organizing such as when the communist led Worker’s Unity League tried organizing workers in B.C. in later 1932. Police also regularly engaged in mass arrests at protests and strikes. The best know example was the suppression of the On-to-Ottawa Trek in 1935. Other examples include attacking a 1933 funeral procession for a suspected communist that was shot and killed earlier by police in Montreal. 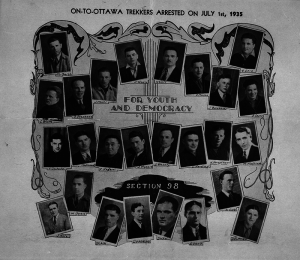 Communist Party of Canada poster, showing participants in the On-to-Ottawa Trek arrested under Section 98. Library and Archives Canada image, MIKAN 3408324, from Wikipedia. Throughout all this, J.S. 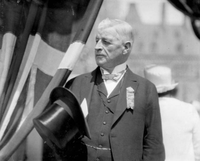 Woodsworth and other progressives found themselves opposing tactics they became familiar with during the repression of the working-class protests that emerged from the First World War. They recognized that Section 98 was justifying violence and intimidation against communists and anyone with similar views, in yet another Red Scare. Protests against Section 98 intensified during the 1930s and were organized by a communist group called the Canadian Labor Defence League (CLDL). Founded in 1925, it sought cooperation from other moderate leftists like F.R. Scott and the Cooperative Commonwealth Federation (CCF) to continually agitate against Section 98 and it viewed its fight as being necessary for the “rights” of Canadians, a novel concept at the time. A repeal movement began and it contributed to the formation of the first civil rights groups in Canada such as the Canadian Civil Liberties Protective Association (CCLPA) Canada’s first civil liberties association. The early civil rights movement in Canada occurred because of opposition to Section 98 which brought together communists, liberals, and social democrats and even some conservatives who thought the law went too far. It was state repression against communists and labour organizations, due to Section 98 and the deportations linked to it, which led many Canadians to view themselves as being in need of civil rights and as liberal citizens whose rights were supposed to be protected by the state. 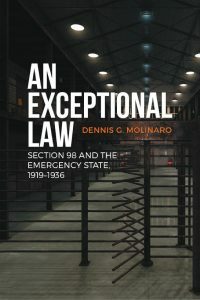 Dennis Molinaro is the author of An Exceptional Law: Section 98 and the Emergency State, 1919-1936. It will be available from the University of Toronto Press on June 16, 2017. His current research about the Canadian government’s Cold War-era domestic surveillance program was recently reported on by CBC News here and here. Find Dennis online here: dennismolinaro.ca. Dennis G. Molinaro, ‘A Species of Treason? Deportation and Nation-Building in the Case of Tomo ?a?i? 1931-1934,’ Canadian Historical Review 91,1 (March 2010. Dennis Molinaro, ‘Section 98: The Trial of Rex v. Buck et al and the “State of Exception” in Canada, 1919-1936,’ in Barry Wright, Susan Binnie and Eric Tucker eds., Canadian State Trials Volume IV: Security, Dissent and the Limits of Toleration in War and Peace 1914-1939 (Toronto: Osgoode Society for Canadian Legal History and UTP, 2015).